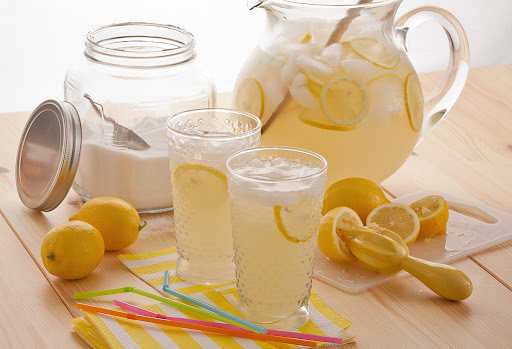 What do you do when a food stylist brings you lemons? 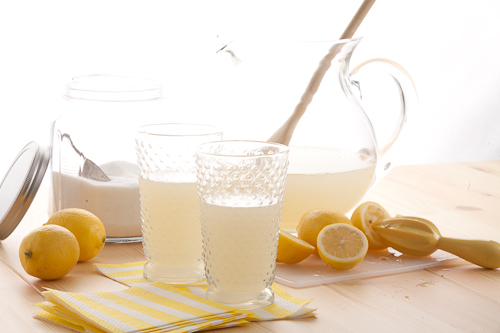 … make lemonade. With most food photography, especially editorial or feature shots, I look to create a scene that tells a story. Mine was a hot bright summer day with light bathing a picnic table into pale tones, allowing the lemons to dominate the color palette. I needed the right props, clear, not plain, and translucent to allow the light coming through, giving interest to any textures of the glass. A chat with the food stylist helped to produce an assortment. On set, with my camera tethered to a larger monitor, I could see how the props would look, judge their size, color and their relationship to each other. Much like doing a model’s test shoot, one can see if a prop has a photogenic quality. Placing them all together on the set, and getting an overall shot, I picked out the “stars”. My lighting was not yet the issue, although I had a general sense of what I wanted, I would deal with the technical part later. Props selected, I began moving them around in various positions, until a pleasing composition took shape. At that point I created the lighting carefully measured for the effect I wanted. Once in place, it was now time to call on the stylist and bring in the real food product. Sometimes a stand in is used for cases where a particular food can’t sit long, even fresh lemons. There are some shoots where it may not seem like very much is needed and the reason for hiring a stylist is questionable, but there is a big difference between having and not having one on set. What may seem like a small effort needed, really isn’t and doesn’t go unnoticed by the camera once done. 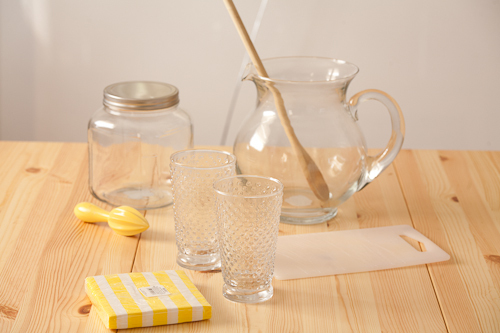 The placement of the lemons on the right, and the twisted slices in the glass and pitcher in the final shot is a good example. A good stylist can take your directions from how the shot looks from your camera’s angle, and your point of view. They know how to primp and play the product into your frame. A great stylist offers positive suggestions, some alternatives and puts their mark on the shot like brush strokes on a painting. The nuances a good stylist can add are well worth having them on the shoot. Moving along, slight changes take place including camera angles and some alternate light variations. A move here and there, an addition to or a take away from brings the shot together…. and sometimes a happy accident brings a surprise that makes the shot… like Dropping the straws!